Ideally situated in the centre of Toulon and close to the seaside, the Hotel Amirauté is ideal for both tourist breaks and business trips. This 3-star hotel, which was completely renovated in 2015, welcomes you amidst elegant contemporary decor that features bright colours and designer furniture. A wealth of style can be found in each of its 58 well-appointed rooms, including several family rooms capable of accommodating up to 6 people. You will be charmed and delighted by its warmly welcoming atmosphere and the comfort of its facilities! Here at the hotel, everything is done to ensure that your stay is a complete success. You can benefit from the assistance of a friendly and available team who will answer your questions and respond to your needs. The Hotel Amirauté also offers numerous services for your comfort and convenience, including free Wi-Fi connectivity, a business centre and a meeting room, a varied and tasty breakfast, drinks offered throughout the day, board games and a baby kit especially designed for families on vacation. 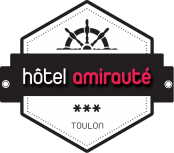 The Hotel Amirauté enjoys an ideal location in the centre of Toulon. Housed in a beautiful Haussmann-era building just 300 metres from the railway station and 400 metres from the port, it is served by a number of bus and boat services that allow you to reach the beaches of Mourillon in just a few minutes. Nearby, you will also find a wide selection of shops, museums, cinemas, bars and restaurants to suit all tastes. Visit the harbour and the island of Porquerolles. Ride the cable car and tourist train, explore the children's discovery trail ... Whatever your preferences, the team of the hotel is available to advise you regarding the many excursions and activities offered nearby. A concierge service and tour guides are available for the duration of your stay.